Several Central Virginia localities next year will have the biggest insurance premium increases under the Affordable Care Act in the entire country. The premiums offered on the individual marketplace by the Affordable Care Act, also known as Obamacare, will increase across Virginia and in most of the country in 2018, but people in the city of Charlottesville and Albemarle, Fluvanna and Greene counties who are ineligible for subsidies will see premium increases of between 195 percent to 247 percent in 2018, according to federal data. The average increase nationally is 17 percent to 35 percent. For 2018 in Albemarle County, there is only one insurance provider (Optima Health) and they are charging close to $2,000 per month for a family of three to get a basic HSA-ineligible catastrophic plan (the cheapest plan). In 2017, my family of three had Anthem catastrophic plans ($6,850 deductible) with an HSA totaling $548.39 per month. In 2018, my family’s cheapest offered plan is this HSA-ineligible plan costing $1,595.46 per month ($19,145.52 for 2018). The only HSA-eligible plan is $1,826.57 per month ($21,918.84 for 2018). For more, see “Income levels & savings” at Healthcare.Gov. If I have an MAGI of $81,680 exactly, I would qualify for a premium tax credit of $1,668 per month. That would make my premiums free (or $158.57 per month for an HSA). If my MAGI is one dollar higher at $81,681, I would be ineligible for a premium tax credit. It hurts to be a productive, frugal member of society these days. In the lifelong battle against procrastination and laziness, it hurts to have rent-seeking be worth so much more than additional income. Imagine a family whose 40-hour week makes an annual income of $101,696 ($48 hourly wage). Healthcare would cost $21,919 for the HSA plan, making their take-home pay only $79,777 after health insurance. Now imagine we reduce their hours to only working 32 hours a week and take off the remaining 8 hours, say all day Friday. Their income would be $81,357, which is below the $81,680 line, and they would qualify for a subsidy of $20,016 for the year, making insurance only cost $1,903 for the year. Their take-home pay would be $79,454 after health insurance. That is 52 days richer while only $323 poorer. Put another way, their 8 hours of work on Friday would have only earned them $0.78 per hour above getting the subsidy, even though their normal wage is $48 per hour. How can anyone justify productivity under these conditions? Perhaps, Atlas will shrug in 2018. 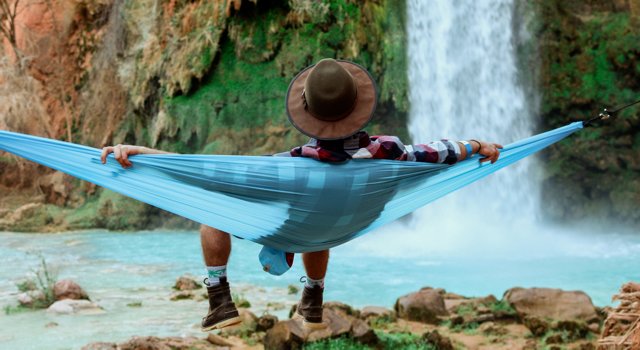 Perhaps, the high end of the middle class will call 2018 a sabbatical year, slashing their hours and reclining on the government’s hammock until this mess gets cleaned up. There are options for getting an MAGI traditionally above the limit below the limit without taking a pay cut, but they all come at some cost. Any of the strategies in “How to Lower Your AGI and Why You’d Want To” would help qualify for health insurance premiums. My fear would be that you’d try a lot of them and then end up $1 too high. Or after all this careful planning, Congress will pass a midnight Dec 31st bill removing the subsidies and requiring upper income participants to pay back what they’ve benefited from. If at the end of the year you’ve taken more advance payments of the premium tax credit than you’re eligible for, you may have to pay money back when you file your federal income tax return. This is called “reconciling” the advance payments of the premium tax credit and the actual premium tax credit you qualify for based on your final 2018 income. So, this means if they change the rules mid-year or you earn just $1 too much ($81,681 vs. $81,680), you could end up owing your entire premium on your tax return! For my cheapest plan, that would be a 19,145% tax on $1. Ouch. Here’s where the IRS comes in. 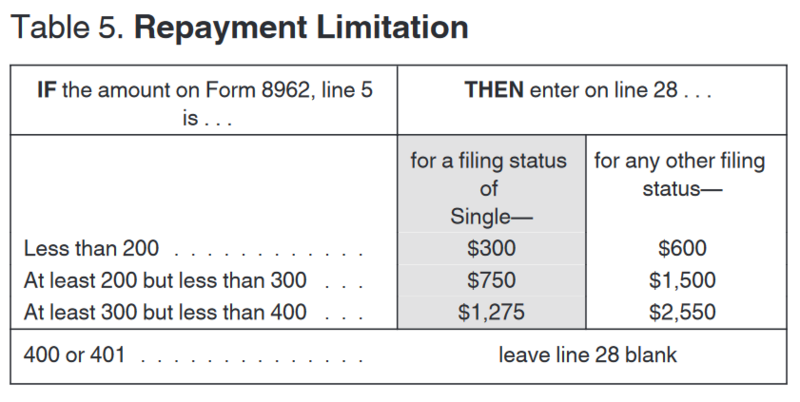 When you file, you will use Form 8962, Premium Tax Credit (PTC) to reconcile the amount of advance credit payments with the amount of your actual premium tax credit. 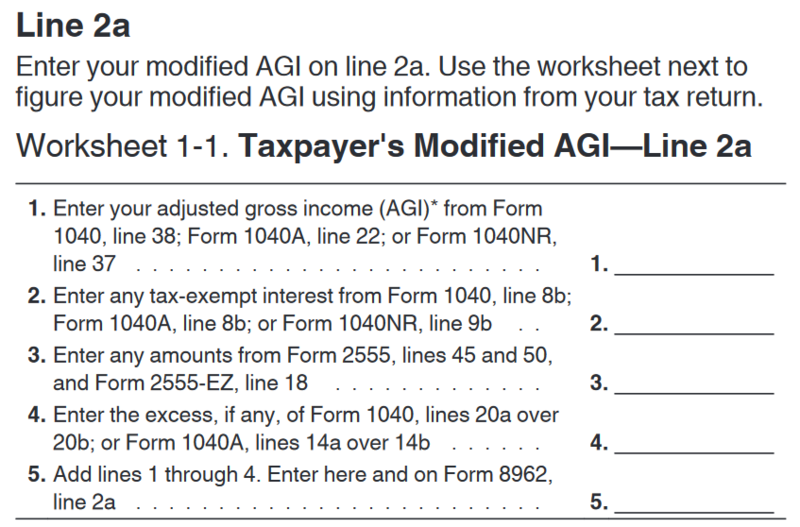 Form 8962 hinges on the line 2 MAGI calculation, which is effectively your AGI. Here’s those instructions. Was your AGI over 401% of the poverty line? No? You get some credit. Yes? No credit for you. Line 5 as mentioned in the table is “Household income as a percentage of federal poverty line.” This means if your income is within 400% of the poverty line then you may not have to repay all if the excess credit you received. If you received $2,000 too much in credit and are 310% above the poverty line, you would only pay back $1,275 of it ($725 discount for your mistake). However, if you thought you were going to get a credit so you got the government to pay but then didn’t qualify (over 400% of poverty line), you owe the whole sum back. Again, no penalty issued here. 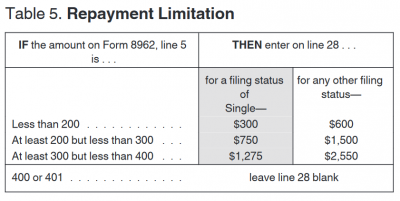 The excess advance premium tax credit is reported on 1040 line 46. This line is then totaled eventually into Total Tax on line 63. This is the line you have to do withholding based on, which means at worst you could end up with an under-withholding penalty. So should we shrug and take an extra day off each week hoping the subsidies will pan out? Or will they change the rules in 2018 to make us lose overall for cutting back?